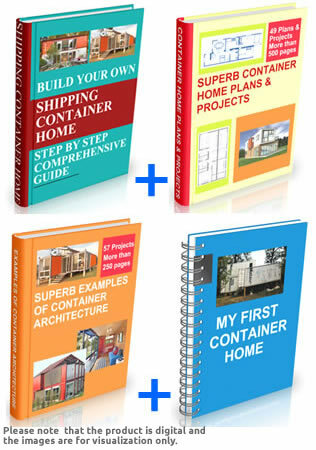 BOOK 1: "BUILD YOUR OWN SHIPPING CONTAINER HOME - STEP BY STEP COMPREHENSIVE GUIDE"
BOOK 2: "SUPERB CONTAINER HOME PLANS & PROJECTS"
BOOK 3: "SUPERB EXAMPLES OF CONTAINER ARCHITECTURE"
BOOK 4: "MY FIRST CONTAINER HOME"
With this package, you will own 4 AMAZING BOOKS containing information gathered in years of experience and hard work. Just imagine the time we spent for not only finding and gathering all of these information together, but for testing and improving them! You can build your own container home, or even you can start your own container home construction business. We have spent years to gather all these information. We guarantee this package will save you a lot of time, a lot of headaches and a lot of money! What we are offering is all the information we have learned from years of experience and hard work, plus many readily made projects, plans and designs, all in one place. Moreover you will have life-time updates for FREE! When you start building your own container home, you will see that this package worths hundreds, even thousands of dollars. "BUILD YOUR OWN SHIPPING CONTAINER HOME - PROFESSIONAL SET"
Unless you are a builder or experienced, building a house is always intimidating. Even a small one. There are thousands of materials, pieces, and tasks involved. But, what containers as perfect modules allow you to do, is simplify the entire process. Think of a typical 1,000 square foot house. Try and work through in your head the total length of timber for the framing, square footage of sheathing, number of floor joists required, and ceiling rafters. Can't do it. Not too many can. 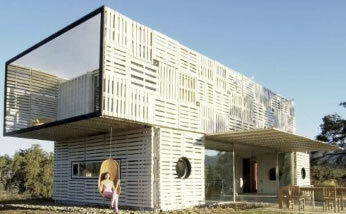 Now think about that 1,000 square foot house made out of shipping containers. It's 3 forty foot containers. By reducing the house into 3 base component pieces (modules), it's much easier to understand, design, and build. It is a new kind of living! 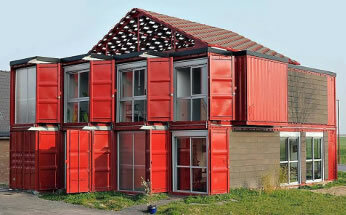 Container homes are the fastest growing type of housing all over the world. Building homes, shelters, and survival bunkers from recycled shipping containers is a very economical and efficient way, and a fast, green, and sustainable approach to build your home. Don't be slaves to banks and rents! Compared with all other types of housing, shipping container homes are the best value and cheapest. If you really need a home, and want to get rid of paying rent every month, but lack the funds to buy a new concrete or pre-fab one, container homes might be right up your alley. You don't have to be a slave to rent any more! And you don't have to be a mortgage slave either! 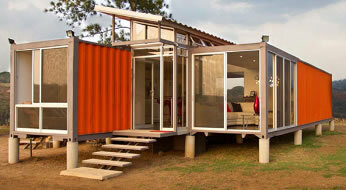 Using one or multiple shipping containers to build with is an excellent method of reusing. It is inexpensive, it’s efficient, and it’s eco-friendly. When you turn a used shipping container into a home, you’re helping contribute to the betterment of the world. 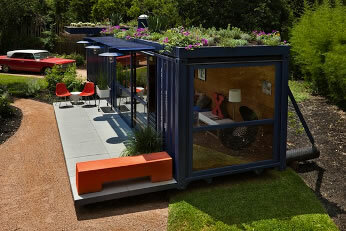 Container homes are also very energy efficient in almost any environment with some creative and inexpensive design. 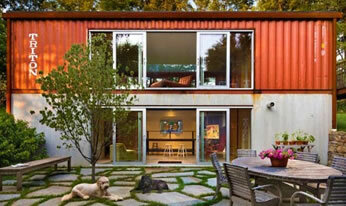 The metal is so cohesive to the ceramic insulation paints that shipping container homes are #1 in energy efficiency. 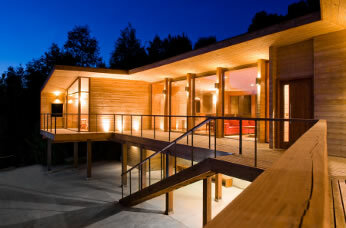 Another very powerful incentive for creating your home from shipping containers is strength. Your home will be made from steel! Containers are made to endure extreme loads and heavy wear and tear. If designed properly, a container home is earthquake proof, tornado proof, fire proof, termite proof, flood resistant, "nature proof". They can be very stylish and you can modify and join them in ways which are very difficult with traditional building materials. You can build anything, from cheap and small, to extremely large and extravagant! These buildings are as unique as the people that build them, no two ever look the same, but cost savings and high strength is inherent in all shipping container structures. Most of the homes that are made from shipping containers, do not look like a shipping container at all. 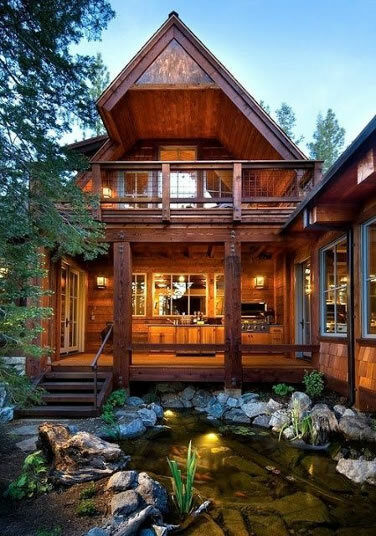 A little bit of creativity, paneling, flooring, and siding and you’d never be able to tell that it's made from large steel modular boxes. They can be covered with any surface, wood, stucco, vinyl siding, or anything. You can find many examples in our books. Moreover the cargo container look is also becoming a bit trendy and some prefer all or part of the home to remain natural. It can be any look you want when finished. From the time you order the raw containers to the time it is ready to live in can be as little as 1 month. You can use shipping containers to build full- and part-time single-family homes and much more. In their most basic form, recycled shipping containers offer a quick and inexpensive solution to emergency housing needs and when stacked sky-high, they make for intriguing dormitory complexes. With shipping containers, you can build any sized homes, whether you want to build a tiny house or a luxurious mansion, it doesn't matter. It all depends on your imagination! 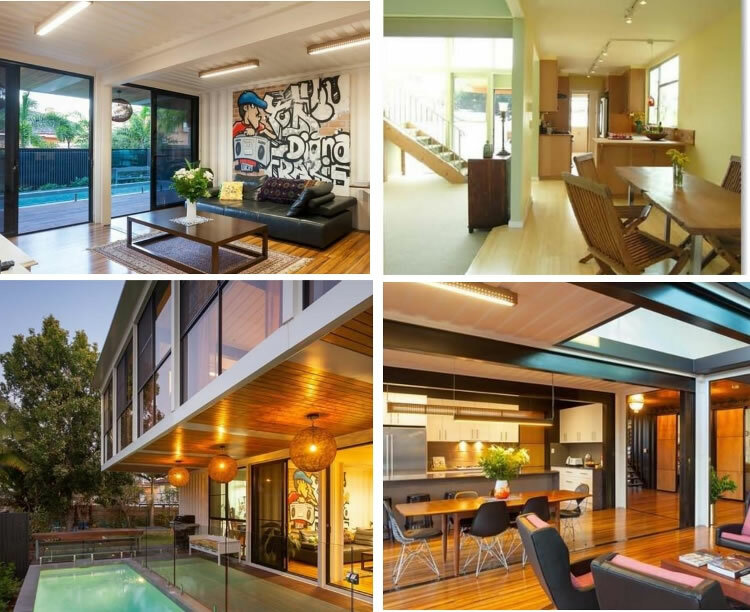 What is most exiting about the shipping container homes is that, with a little imagination, shipping containers can become cheap, reliable building blocks that can be used to build chic little getaway homes and castles of majesty alike! With container homes you can easily upgrade an existing home by simply adding another 40′ container which adds an instant 320′ square feet onto your total living space. 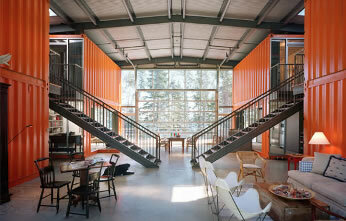 Shipping container construction is the new craze in modern architecture. For most of the designs, you may even not need detailed architecture plans. It is fun like building with legos. And the best of all is that with a little bit of creativity the end result can be just amazing as if it is formed out of a complex acrhitecture design. In this book, you will find detailed information in more than 180 topics about container home building process, container home design, how to plan, design and build your own container home and everything and more you will need to know about container homes. It is a do it yourself and architectural design reference book for converting recycled cargo shipping containers into green homes and buildings. With our books in your possession, there’s virtually NO LIMIT to what you can build. You will find everything you need to know about building your own container home, with step by step and detailed explanations. You don't have to face the difficulties that we have faced when building our first container home years ago! You don't have to spend a lot of money buying the wrong materials, or ruining everything and have to start all over again. You don't have to re-discover the building process! We gathered everything you need to know and more in this book. This is a 215+ page book written in regular type size. Not a small e-book written in big and bold type size with enormously wide margins in order just to make it look like a thick book and increase the page number! This isn't a book written by an amateur guy, but it is written systematically by professional builders, including crucial information obtained with hard work and years of experience. This is a do not miss opportunity! "BUILD YOUR OWN SHIPPING CONTAINER HOME, STEP BY STEP COMPREHENSIVE GUIDE" contains everything you need to know and more, to start building your own container home or other projects - and with zero frustration or wasted money. When you start building your own container home, you will see that this book worths hundreds, even thousands of dollars. This is a 550+ page full color digital book showcasing the most amazing 60 shipping container home plans and projects from all over the world, including the ones that have most influenced the container home market. All of these amazing container home projects are given with plans, either as floor plans, or as 3D Models; plus hundreds of full color exterior and interior photographs as well as construction shots for each home showing the layout of the containers. Before designing and making your own project, it is always good to check what other people did. Imagination and creativity works in mysterious ways. Other people might have come out with amazing ideas which may change your life completely. 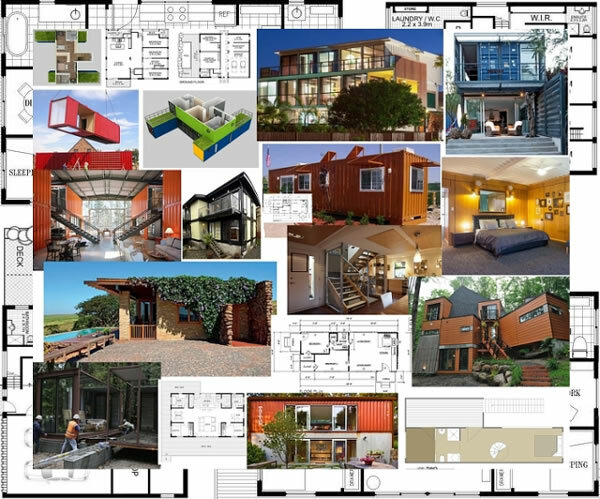 ✔ 38 Different SHIPPING CONTAINER HOME PROJECTS with plans (either as floor plans, or as 3D Models) with hundreds of photographs of interior and exterior views and construction shots. This is a 280+ page full color digital book showcasing total 60 shipping container homes from all over the world. You will find lots of inspiration from other peoples projects. You will have hundreds of full color detailed photographs of each home, including both exterior and interior views, which will help you design your new home (or start your own business) with lots of interesting ideas. This is a 56 page book, consisting of a real life experince of a person who built a container house with her friends. You will find everything in detail, about her thoughts and theories to practice. It will be helpful for those who has never built a container house before, and who is planning to do one especially at minimum cost. You will find what difficulties she faced and how she solved the problems, with step by step explanations. 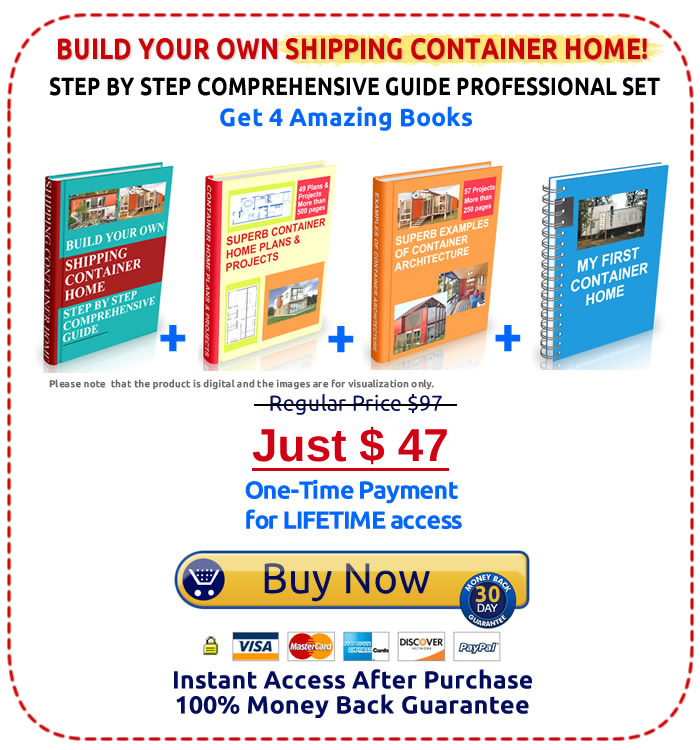 With "BUILD YOUR OWN SHIPPING CONTAINER HOME, STEP BY STEP COMPREHENSIVE GUIDE" plus this "MY FIRST CONTAINER HOME" book in your possession, there is no limit for you. Don't postpone your dreams. You can start building your own container home now! Everything about ISO shipping containers. How to Plan Container Home Construction. How to Determine the Budget. How to Create a Floor Plan and Site Layout. How to Design your Container Home. Everything about Footings and Foundations. Issues of Rust, Doors, Locking Mechanisms, Floor etc..
How to Make Repairs on Used Shipping Containers. Finishing Aspects: Stairways, Doors, Windows etc. Roofs. Green Roof and Framing. Massing Examples with Shipping Containers. Container Home Floor Plans & Interiors. Lots of Floor plans and 3D Models. 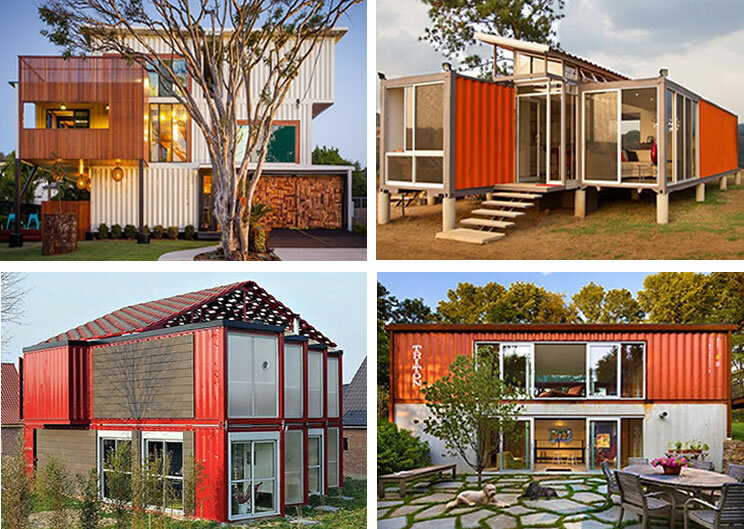 60 shipping container homes from the world. My first Container Home Book. Home Design Planner Application Bonus. We will give you this amazing software which we use for our work. There are many free softwares in the market, and it is really difficult to find out which one to use, which one is the best and so on... Thus we want to save you from this frustrating search too! This is an amazing home design planner application, which helps you draw the plan of your house, arrange furniture on it and visit the results in 3D. It is one of the best 3D modeling application available and will help you cut down on the guesswork. You can plan all of your rooms, including kitchen and bathroom or office. 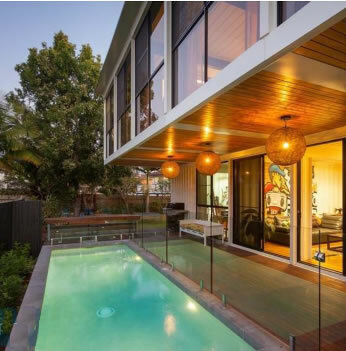 You can design not only the interior, but also the exterior of your home, your garden, the swimming pool, etc.. It helps you design everything you can think of about a home. 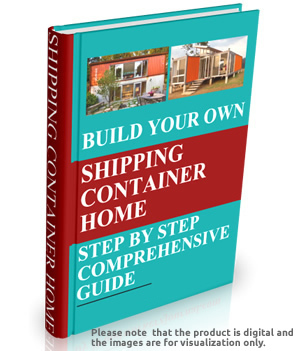 215+ pages in ‘BUILD YOUR OWN SHIPPING CONTAINER HOME, STEP BY STEP COMPREHENSIVE GUIDE’ book. 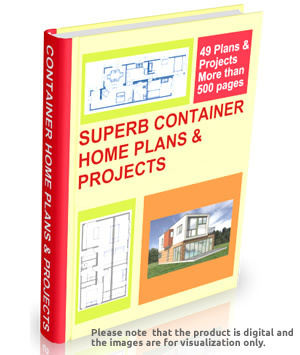 550+ pages in "SUPERB CONTAINER HOME PLANS & PROJECTS" book. 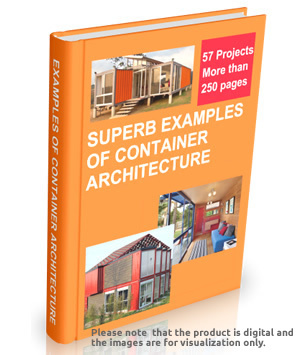 280+ pages in "SUPERB EXAMPLES OF CONTAINER ARCHITECTURE" book. 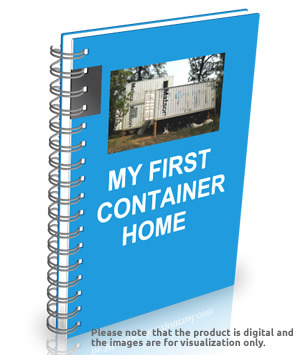 56 pages in "MY FIRST CONTAINER HOME" book. Home Interior design planner application. 4 Amazing Books totalling over 1100 pages!!! 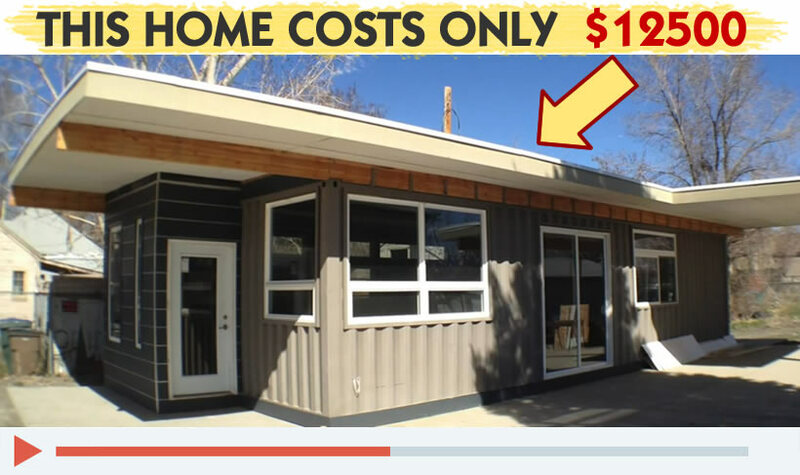 With this package, you will find everything (and more) you need to build your own container home or other projects, or to start your own building business - and with zero frustration or wasted money! Whether you are wanting to build now or just tossing ideas around, we guarantee this package will be very useful to you. This package is a do not miss opportunity! We guarantee that our books will help you build your own container home projects easily with zero frustration or wasted money. 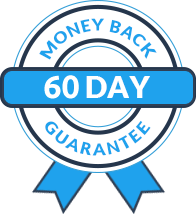 So that we're offering an unconditional, NO-question-asked 60-day money back guarantee. You've probably read testimonials like these before and you're probably still skeptical on how good these books really are? That's why, you risk absolutely nothing by trying. Yes, We are giving you 60 days to try and see. If, after viewing the books, within your 60-day guarantee period, you are convinced the books won't be helpful for you.. simply contact us.. and you will receive a prompt refund. It took us 10 years to compile, test and perfect our knowledge of container architecture and gather the best plans and projects. It's worked for so many people, that we are betting it will work for you, too... And if it doesn't... you get your refund, promptly and without hassle. OK, so what's the cost of this enormous package? How much would you pay for a complete guide consisting over 1100 pages, to never waste money and spend hours finding out how to build a container home, what is the easiest way, how to plan and design, how to determine the budget, how to purchase containers, how to have them delivered, how to find out about the pre-purchase inspection, how to create a floor plan and site layout, how to deal with insulation, how to build footings and foundation, how to deal with doors, windows, heaters and insulation, roofs, painting, and a lot more answers and solutions to all of the questions about the process, and at the same time find out what other people did, and own a lot of readily made floor plans and projects? For less than 30 bucks you can save a ton of money and countless hours of frustration on your projects. Please Note: This is a digital product available for purchase as a digital download. No physical product will be delivered to you. The books are in PDF format and can be read by any device that has free Adobe PDF reader. All content appearing on this website is proprietary, copyrighted, and owned or licensed by shippingcontainerhome.club. Any unauthorized use of trademarks or content from this website is strictly prohibited. All rights reserved.